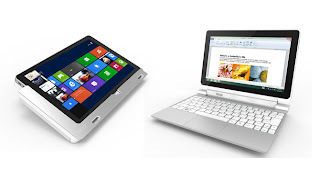 As we had discussed earlier a couple of months back about the Acer's Iconia W510 Windows 8 tablet. The tablet was revealed officially in June and now the company is releasing the price info and the launch date. The tablet will be available in the US and Canada from November 9 for $ 500 approx. For the 32GB solid state disk and the model with a 64GB SSD and a keyboard docking station will cost you $749.99. Both the models feature 10.1 inch, 1366 x 768 pixel Gorilla Glass displays, 2GB of RAM, 802.11n WiFi, micro HDMI ports, and an 8MP rear camera and front-facing 2MP camera. It comes with 1.7GHz Intel Core i5-3317U “IvyBridge” processor, 750 GB hard disk drive. It also comes with a DVD drive. The tablet measures 0.35 inches thick, and weigh 1.3 pounds. With the keyboard dock the Iconia W510 weighs 2.6 pounds and measures 0.84 inches thick. The tablet alone has a battery which Acer says is good for up to 9 hours of run time. Since the keyboard has a built-in battery, you can get up to 18 hours of battery life when the tablet is docked. The dock also has a full-sized USB port. The $500 starting price is much better than the $800 figure Acer was throwing around in June. The Iconia W510 is one of the most affordable Windows 8 tablets seen till date — although plenty of companies have yet to reveal the pricing for their upcoming Windows 8 computers. 0 Respones to "Acer sets the Iconia W510 price at $500"